Taylor has always loved 'reading' newspapers and magazines and can entertain herself for quite some time. Yesterday was having so much fun and seemed to be concentrating very hard on what she was reading. Hope everyone is staying inside where it's safe and warm on this cold Texas Tuesday! Chris actually snapped this picture for me. I promised you a video and it's worth the wait. For those of you who knew me when I was little will understand why this was so exciting. Listen carefully at the beginning because she is actually 'talking' to the toy. Mia is the one who first introduced this toy and so we got one out at home. As soon as I got ours out, Taylor got so excited and couldn't wait to hold her. Yes, that's right. Taylor just might be a Barbie girl like her mama. Good thing I had my mom keep all my Barbies just in case I had a little girl that wanted to play with Barbies too! Taylor is really showing her sweet and vibrant personality more and more every day. We celebrated her first Christmas and loved watching her priceless faces at each new present. Peek-a-boo has always been a favorite game, but loves playing the crawling version that daddy created and has learned to hold the blanket up by herself to play. It's always an adventure to see how I will find her in the morning or after naps since she flips and flops all during the night. She has even taken after mommy in the drooling category! Since Taylor has two teeth now, it was time to start good dental hygene by brushing those teeth. It starts off by me brushing her teeth and bottom gums(and attempts at the top gums) and then Taylor takes over to finish up. Taylor still loves cats and finds Sadie(our dog) more entertaining everyday. We are working on how to pet animals without hurting them. Another thing we are working on in 'No'. Taylor has a few things that are no-no's and she will continuously check them out. She either finds it funny when I tell her no or she will turn the waterworks on faster than could be. She tends to examine her toys and try to figure how they work. Will take a few steps while holding on to your fingers, but prefers to crawl. She is super speed demon on all fours! Weighed 19.75 lbs and was 28 inches long when we went to the doctor. Taylor decided sitting in the chair was not fun and she wanted to go unstack the clothes in her closet instead. So I waited until the next day and tried again. I had much better success at getting Taylor to look at the camera, but staying in the chair was still not successful. She was being quite a ham and I just love this last picture I caught! Stay tuned because I have a great video and picture ready for Taylor Tuesday! I keep a basket downstairs for all of Chris' stuff that is left on the kitchen table. Taylor finds this basket very interesting since it is full of items that she should not have. Yesterday she was entertained by taking the items out, I would put them back, and repeat. It was too cute to watch her concentrate so hard on what item she wanted to take out next. Plus I had to put my bon-bons down so that I could keep putting all the items back in the basket. Now if I could just teach her to put the items in as Daddy takes them out I wouldn't have to put my bon-bons down! I FINALLY finished the bulletin board for my mom that I promised her months ago. I'm even going to make her come to Austin to get it. She wanted a girly bulletin board for my old bedroom at home that has been painted pink and taken over by the grandaughters. I figured white boa screams girly and the pink fabric was just too cute to pass up. Who knows what else I will come up with to add to the board by the time my mom comes to pick it up. More is better right??? After weeks of repeating one word over and over to Taylor, she finally said it! Sorry Mia, Nana, Aunt KK, and PawPaw but this mama is so happy that I was next. I'll start working on your names now! What do you think? Cute or not? Poor Chris is a constant sounding board for my decorating so I figured I would give him a break for once. Another one of my crafty projects was the ornaments that I made for Taylor's 1st Christmas. I wanted something to hang on our tree to commemorate this year, but something we could also give the grandparents for Christmas. I my mind this was going to be a simple project that I could do while Chris was at work. WRONG! It is not as easy as you would think to get a 8 month old to push her hand into clay. I love the turnout once Chris was able to help out. Taylor was so funny about doing a great hand print, but digging her index finger into the clay. There were a couple ornaments that died in the making process since she decided to push completely through the clay altogether. Check out our completed project. This was super easy and the clay was homemade and baby safe. I used a straw to make the holes for the ribbon and wrote with sharpie on the back to mark the year and her name. I have two other projects mid process and will post pics when they are completed. That's all for crafty hour with Wendy! As I took down my Christmas tree this year I enjoyed looking back over the years of your ornaments that I have been collecting. It all started when my mom bought me one my freshman year at Tech. How exciting it was to hang this on my mom's tree and be so proud of my school. She continued to buy them until I graduated. That year was really special because it was the year both Chris and I graduated. I was somewhat disappointed to see a giant 75 on the ornament, but you saved yourself with a few additions of the holly on the sides. 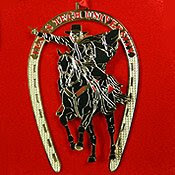 So explain to me why when you can create amazing ornaments like this one(my FAV!) The picture doesn't do it justice, but I couldn't get a good picture with all the shiny gold. So tell me why you would create something so ugly that I would hang the ornament on the back side of the tree, if I had bought it. I didn't buy the ornament this year in protest and hope that you realize by sales figures that it was awful in comparison to past works. I LOVE decorating my our Christmas tree each year. 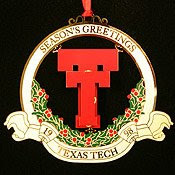 I enjoy placing our beautiful Texas Tech ornaments all around the tree and was sad not to have the 2008 one. Who could love this thing??? So I beg of you, PLEASE stop the maddness and create a beautiful ornament to match those of years past. And I know that there are plenty of more Tech icons that they can symbolize since my roommate in college and I once thought about writing a book about Tech traditions. 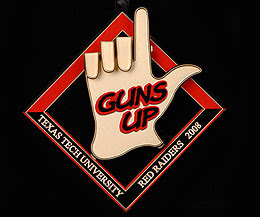 ***For those Red Raider fans that are just now being introduced to the Texas Tech ornaments, you can order them here. 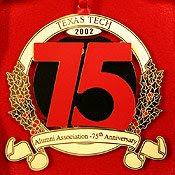 The ornaments are a great item and I believe that part of the price goes towards a scholarship fund. It's our first Taylor Tuesday of 2009! Chris noticed how fascinated Taylor was by seeing herself in the mirror and caught this picture. Taylor definitely kept the hotel maid busy cleaning that mirror! I've posted a video of Tay below so that you can see her and hear the little girl screams that are already occurring in our house. Please excuse my legs in the background, I forgot that by standing behind Taylor to take the video that I would end up in the mirror's reflection. 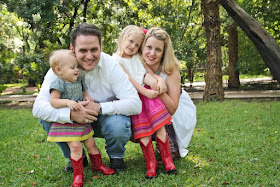 We head to Fort Worth to celebrate with my family the weekend before Christmas. My nieces got to stay the night at my mom's house, so Taylor was able to spend lots of time with her cousins. She just squeals when she sees them. She probably gets that from me, because I LOVE my nieces and get excited when I see them too! This was Taylor's first time to open presents and didn't care to much for them until she saw what was under the wrapping paper. She would squeal with delight and then try to figure out how to get to the new toy. She definitely made opening presents fun and quickly learned that these crazy wrapped items were new toys for her. Good thing Nana put puffs and Cheerios in her stocking, because she loves those! Then we headed to my grandmother's for breakfast on Sunday. Taylor had this gift thing down and just waited for us to open the gifts so that she could see what wonderful thing was in store for her. I just loved watching her excited expressions with each new toy. Chris also made sure to get a picture of me and Taylor since I'm always behind the camera. Skip forward a few days to Christmas Eve. We went we to Midnight Mass(at 11 pm) as we normally do. We took Taylor in her pj's and she tried so hard to stay awake, but didn't even make it to communion. It was interesting to think back to last year since she spent the entire Mass moving around in my belly that I accidentally kicked the pew in front of us. As a new tradition, Chris' family came over to our house for breakfast on Christmas morning so that they could watch Taylor open her presents at home. They also brought over ALL their presents. We couldn't resist taking a picture of Taylor amongst the piles. Once again, we had fun watching Taylor get excited over her new toys, books, and puzzle. I help her with the toys and Chris puts them together/plays with them. Please don't be scared by my pj/no makeup look. We celebrate Christmas morning in our pj's in this family. It was a wonderful Christmas and Taylor is one lucky little girl! We are very blessed to have been able to spend the holiday season with so many family members! We are now trying to figure out where all these toys go and where the off button is for the noisy toys. Any tips from experienced mom's on how to best handle toy organization?